I don't usually mind whenever someone tells a story that has been done before. That is why whenever a biopic or AIDS movie or whatever comes out around awards season, I'm like whatever, just as long as the people behind the film add a new twist to it. Million Dollar Baby kind of does that, but by the end, does it in a way that leans a bit towards cheap sentiment. 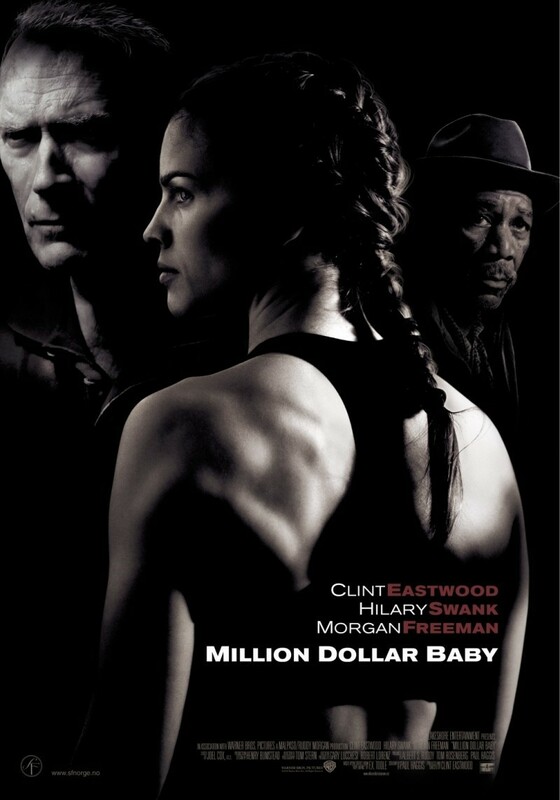 Million Dollar Baby follows the story of a boxing trainer named Frankie Dunn (Clint Eastwood) who has struggled to form a bond with his estranged daughter and whose only friend is a former boxer named Eddie "Scrap-Iron" Dupris (Morgan Freeman). Suddenly, a waitress named Maggie Fitzgerald (Hilary Swank) comes into Frankie's gym and eventually life determined to become a boxing champ, a dream that nobody sees but her. One thing that I did really like was the cinematography. I liked how the cinematographer, Tom Stern, incorporates use of black and white by shining them on the characters. There is one scene that I thought was amazingly shot where Frankie is healing Maggie's wounds and Maggie is put in the shadows, which was a bit of foreshadowing in my opinion for the events that would follow in the film. I especially liked Clint Eastwood's direction. I even thought the actors were brilliant. While I liked the brilliant direction and cinematography, my biggest issue with this film has to be the story. Not only do I feel the story of an underdog rising to the top has already been done, but by the end when a "big thing" happens to Maggie that I won't give away for those that haven't seen it and don't know the ending, I found it to be so emotionally manipulative. Although, to be fair, the filmmakers were probably looking to go in a direction different than what people were expecting and I give them credit for that, but still, it didn't strike a chord with me the way it has with others who saw the film. Also, while the actors were brilliant, I feel like it isn't anything they haven't done before. Eastwood is playing the gruff man. Morgan Freeman plays the wise confidante that is the *gasp* narrator and Hilary Swank plays a character that reminded me of her role in The Next Karate Kid. Like I said, the actors do a wonderful job with what they're given, it's just the roles they played weren't too much of a stretch for them, in my opinion. Overall, Million Dollar Baby is an incredibly well-acted and directed yet slightly contrived film. It has its high points, but it really doesn't throw a hard punch. I would say give it a watch for the actors being amazing and who knows, you might feel differently about the ending than I did. I found it to be a bit calculated but everybody's viewing experience is different. See if it is a knockout or is the type of film to watch only in Round 1.